You are currently browsing the category archive for the ‘Fiber Arts’ category. It turns out that the problematic gene is Chromosome 18, so Jay sent me the first three pages of the detailed readout for C18, which was 143 bases. By using 3 ends per base, this would make for a scarf with a nice width. I noticed that the color coding on the readout was different in one respect from the one I had been using; orange instead of black for guanine. Since the black had been standing out a bit too much, I decided to make that switch. 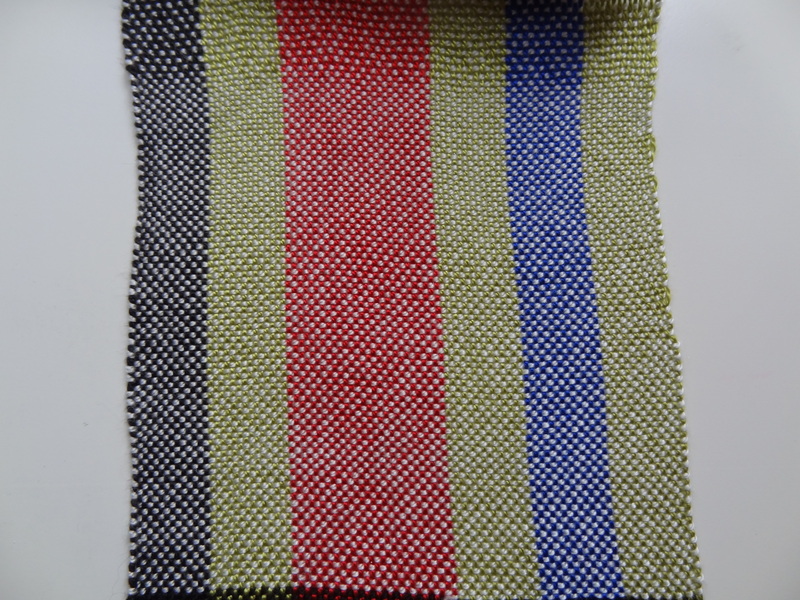 Here’s the final sample, using orange, blue, green, and red, with black as the weft. Jay was visiting Seattle just after I finished it, and he enjoyed being able to see and hold the little piece of fabric. 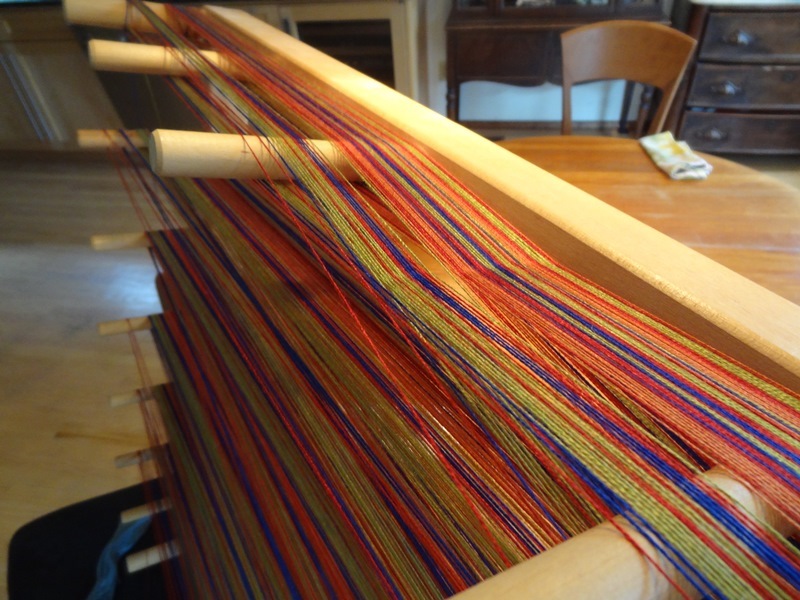 With a good result from the final sample, I plunged into winding the warp for the actual scarves. A tool called a warping board is used to measure the threads of a warp and keep them organized before they are put into the loom. 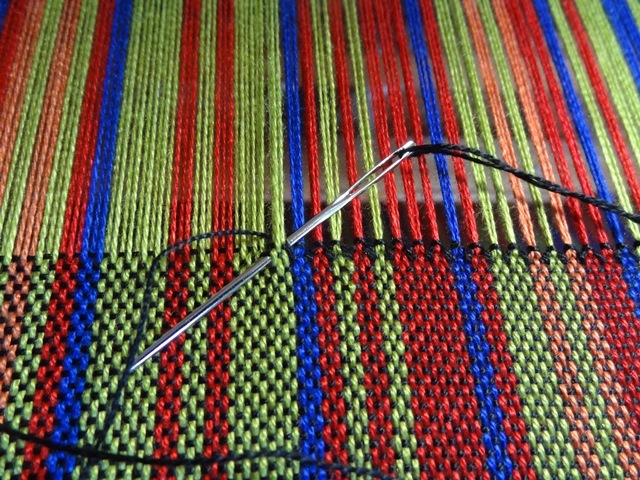 By making a cross of threads going up over a peg in one direction and under the same peg as the thread is wound in the other direction, the exact order of threads is preserved. 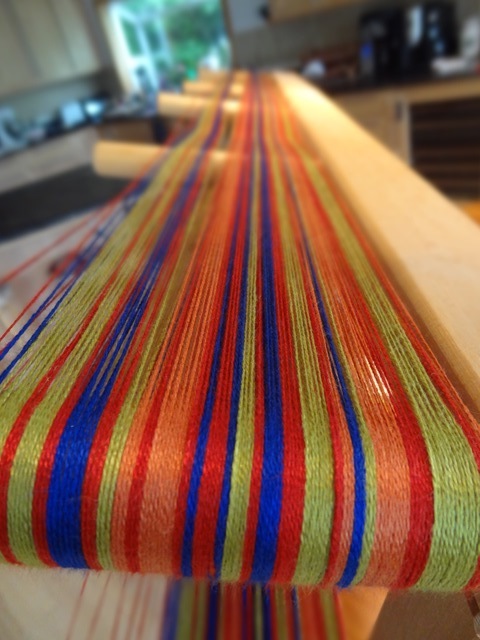 This not only helps prevent tangles, but with complex stripes like this warp has, it keeps everything in precise order. Here’s one section of the warp completed. It was wide enough that I did it in three sections. All three sections with the associated parts of the genome readout. Here’s one warp section with the readout page it is duplicating. 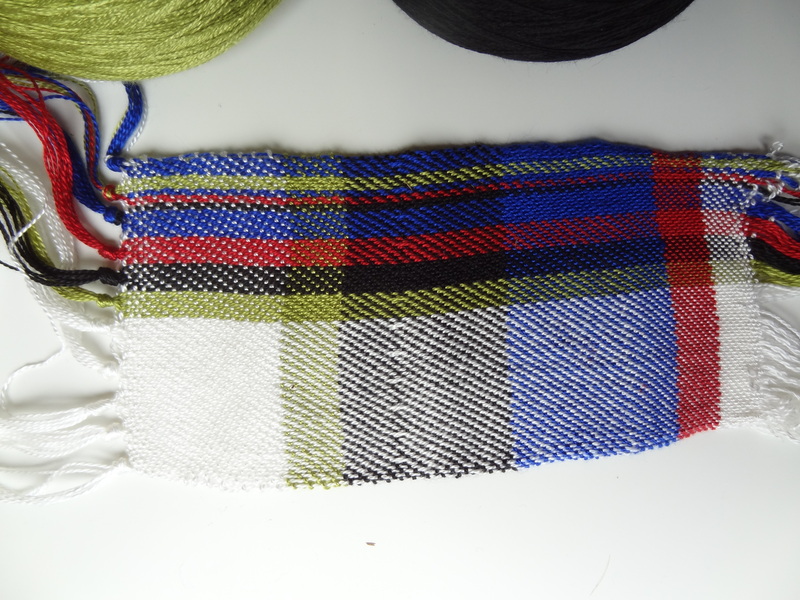 Next step, putting it on the loom! 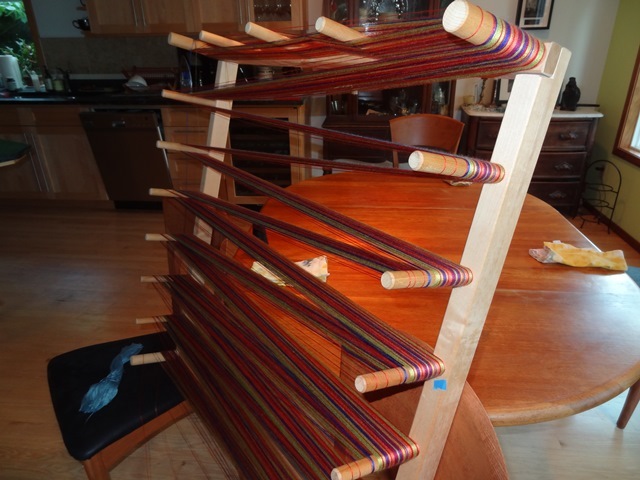 At this point, all three sections are on the loom and through the reed and heddles. The warp is being wound onto the warp beam in the back. I gently comb out any tangles and wind the yarn onto the back beam by using the crank handle you can see on the right. 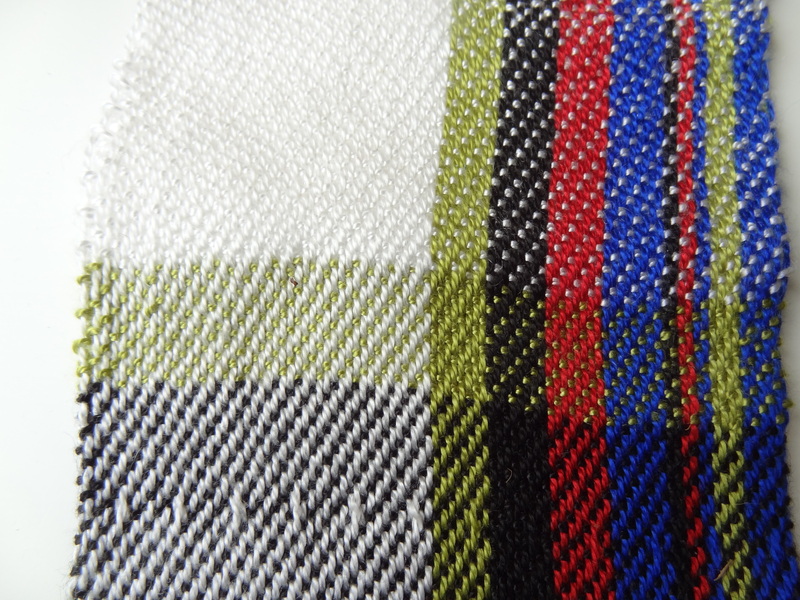 I decided to hemstitch each end of the scarves – an elegant touch that I felt the project deserved. with A across the chromosome, but that two base pairs of A and T are next to each other. The scarf reflects only the half of the data that is represented on the readout. 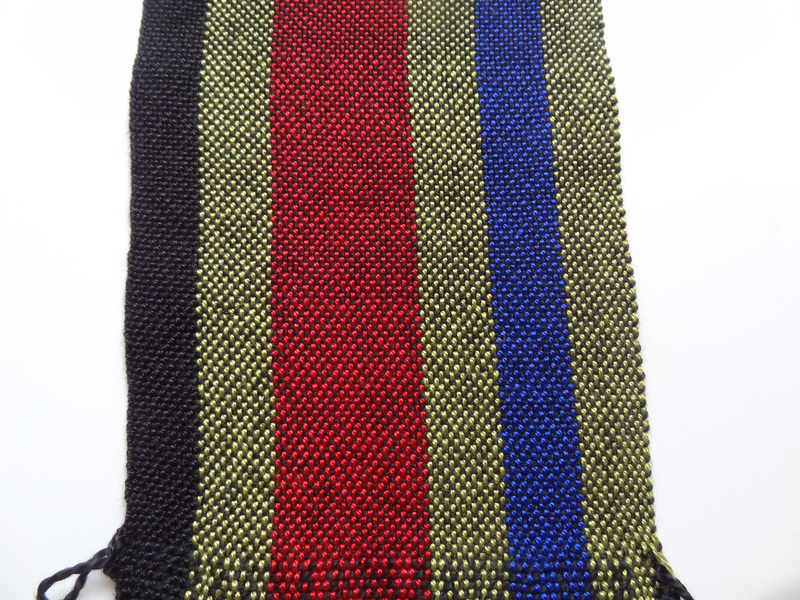 To read the scarf from the beginning of Chromosome 18, align it so that the side with wider green stripes is to the left. 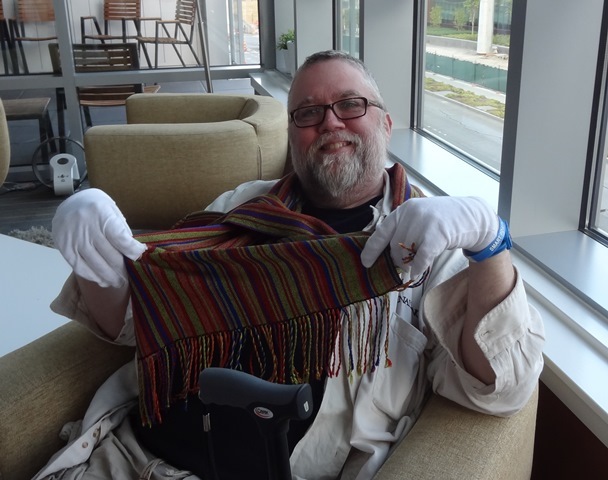 Since Jay was visiting Seattle again a week after I showed him the final sample, I got into high gear to finish the first scarf in time to present it to him in person. He liked, he really liked it! 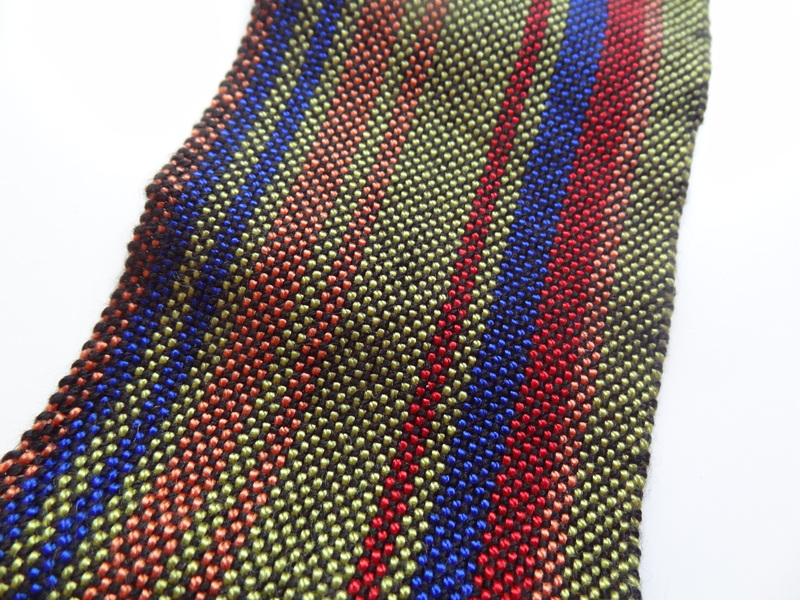 With the first scarf off the loom and delivered to Jay, I plunged into weaving the additional five that were warped up. 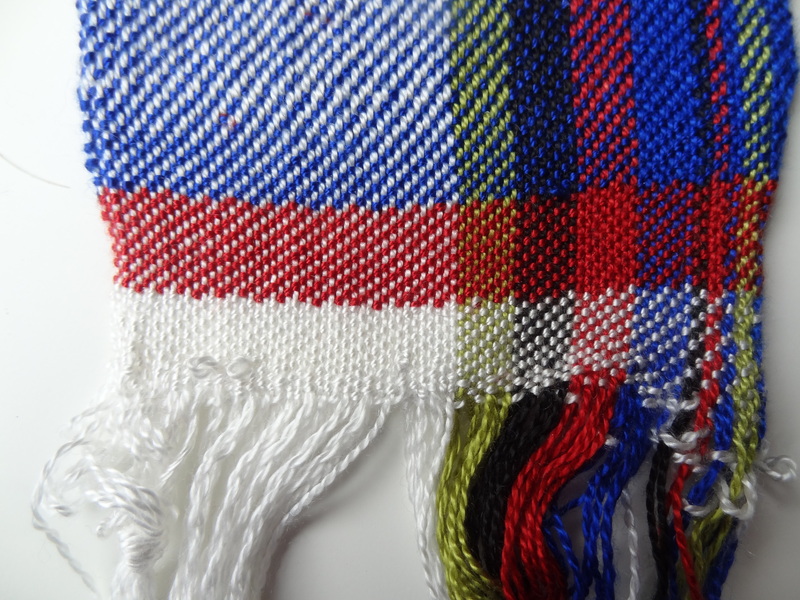 The actual weaving only took about 90 minutes per scarf, plus roughly another 90 minutes to hemstitch both ends. 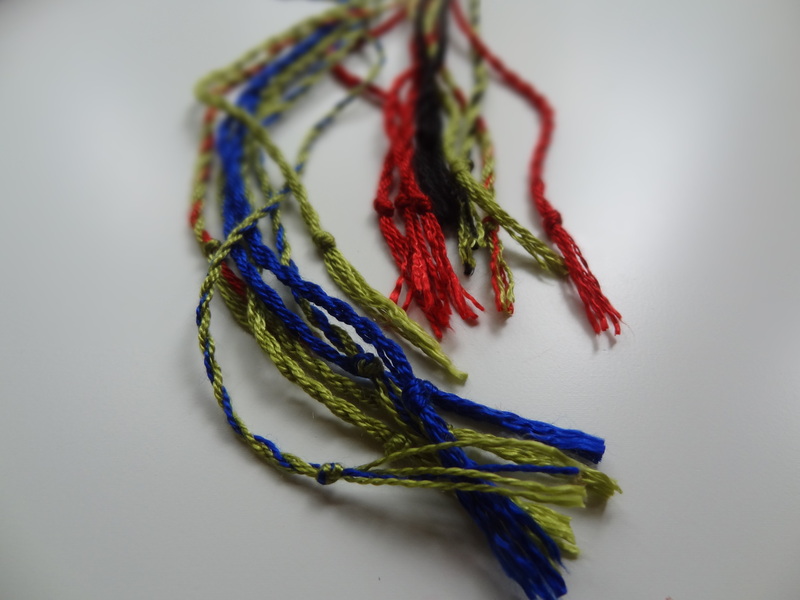 Fringe twisting added another 90 minutes, and it took a bit more time to wash and press them. 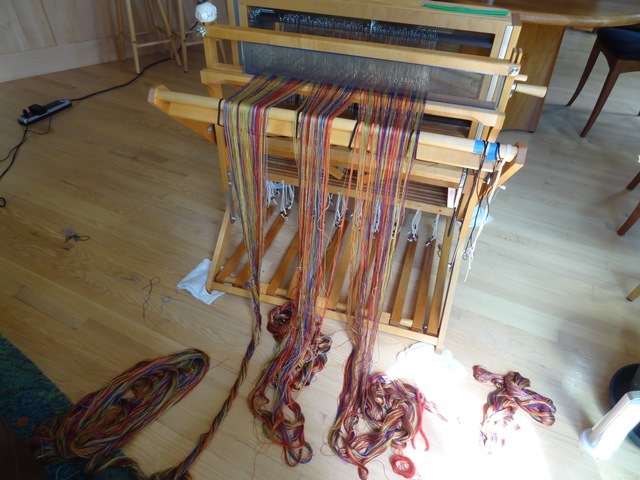 Here the scarves are all off the loom and I’m cutting apart the unwoven warp between scarves that gets turned into the fringe. 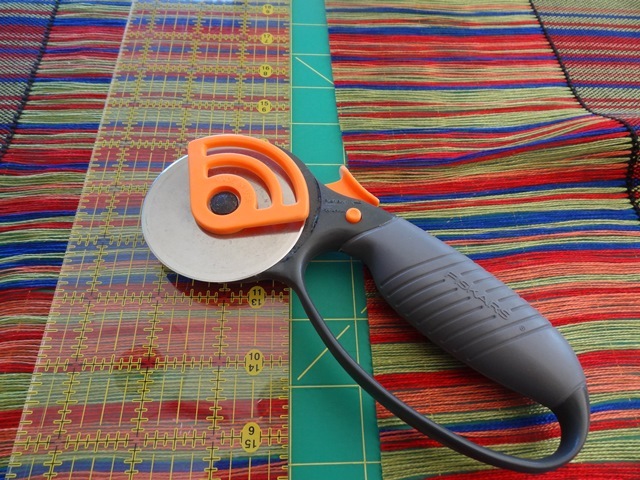 A rotary cutter is the perfect tool for this. 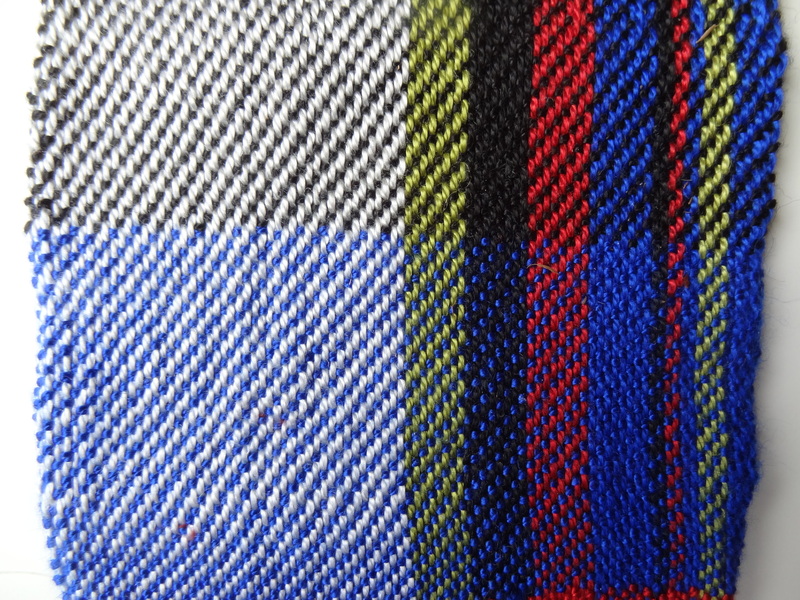 You can see the hemstitching that marks the end of one scarf and the beginning of the next. Miles of twisted fringe! I would probably still be making twisted fringe had Syne Mitchell not kindly lent me her electric fringe twister. This project has been a privilege to work on. The work is intended to be a manifestation of respect, admiration, and love, based on a small part of the genetic code that created a remarkable person, Jay Lake. The recipients of the additional scarves are people who have helped him in his time of need, and I honor their gifts of time, energy, and support to him with my own. I’ve done another sample on this project. Since I last posted, Jay’s timeline has become significantly shorter. I have some commitments that keep me from plunging into working on this full time, but I do want to get the scarves to Jay in time for him to have some time enjoy them. 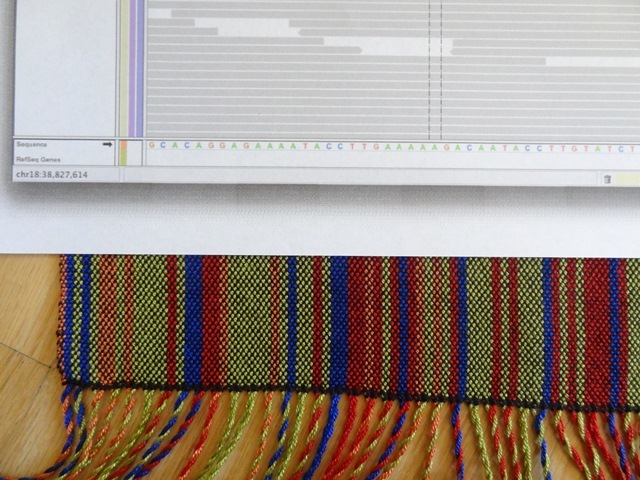 LoneStarCon 3 will be doing a display about the entire genomic sequencing project and its implications for the future of medicine, and they asked to display one of the scarves, so that deadline (end of August) had originally been my goal. Now, though, any day earlier would a Good Thing. With that backdrop, here is the next sample. 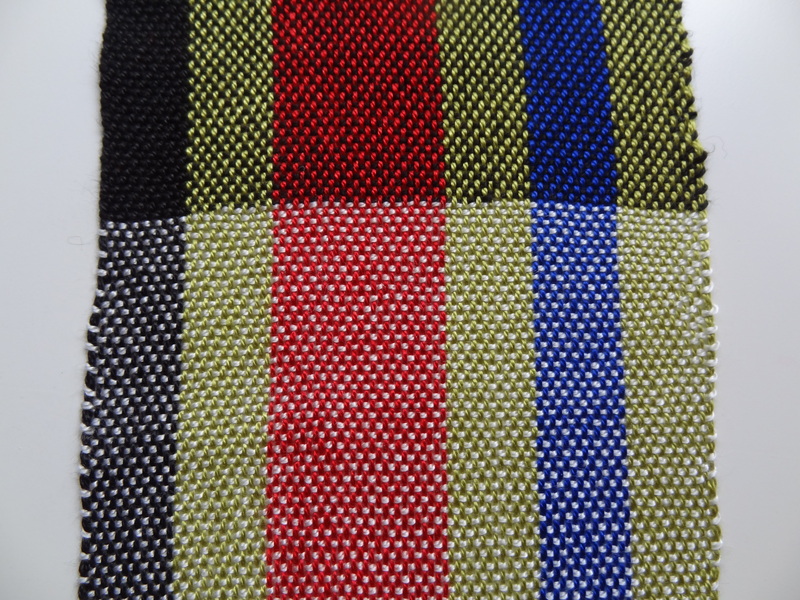 I’ve decided that simple plain weave shows the color sequences best, and that weft stripes is the way to go. By using the color coding of G – black, C – blue, T – red, and A – green for adenine (A), thymine (T), cytosine (C), and guanine (G), this sample spells out GATTACA — which is a really good movie exploring some ideas about the future of gene testing gone awry. 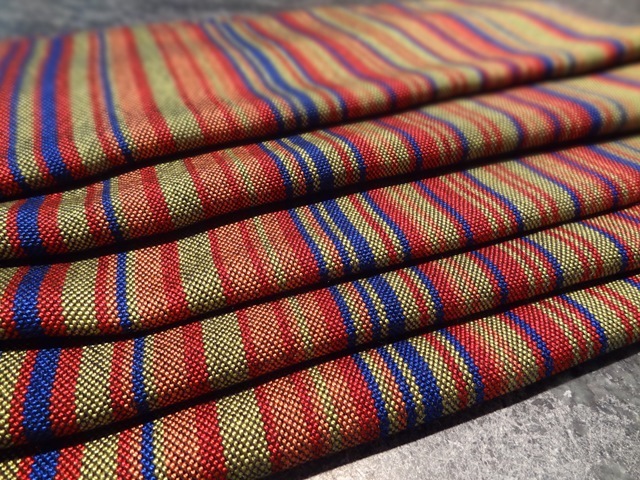 This section is sett at 24 epi, which is weaver’s shorthand for 24 threads (ends) per inch, and woven with black weft. Pretty nice. Same sett, but with white weft. I think this makes the stripes too pale looking. I decided to try resleying the reed to get 20epi, so here is that, with white then black weft. 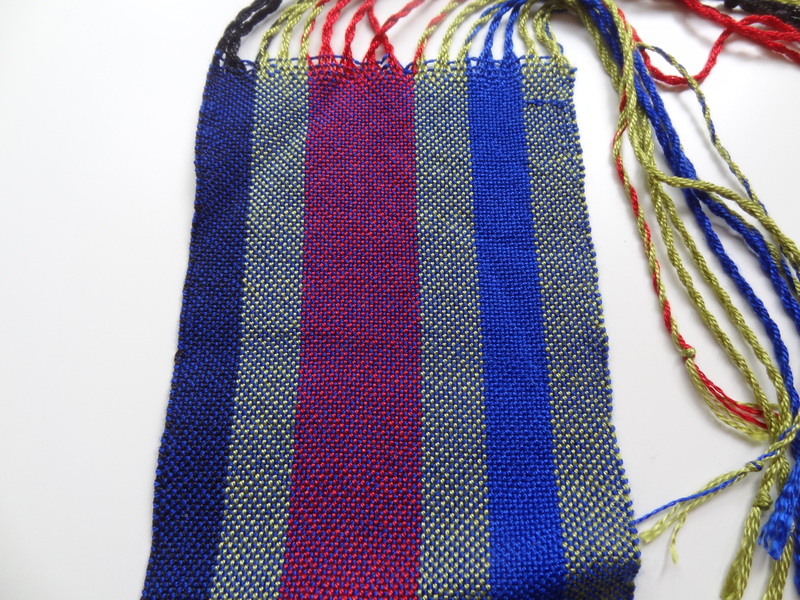 And here is 20 epi woven with blue weft. Too blue. Here are the 24 epi (left) and 20 epi (right) side by side. The 20 epi is too loose. 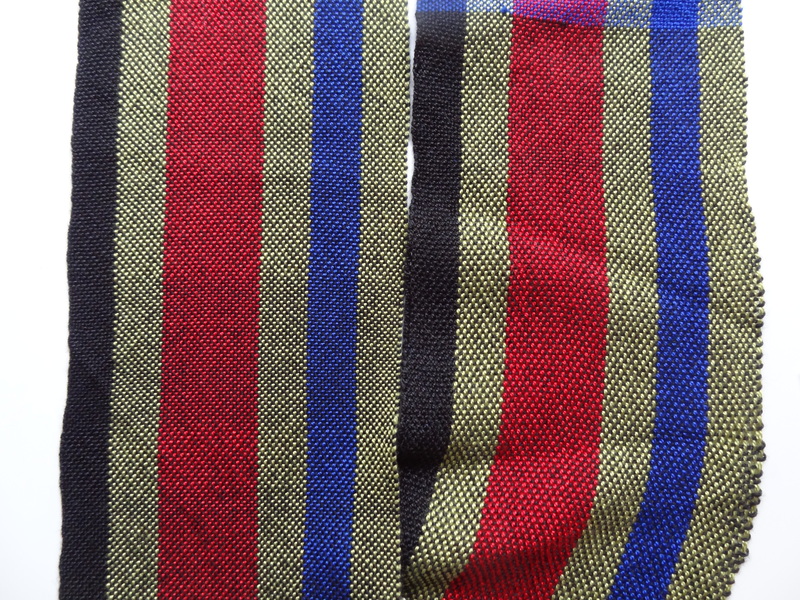 I’m having trouble maintaining a good selvedge on the right side, and it not as sturdy a cloth as the 24 epi. 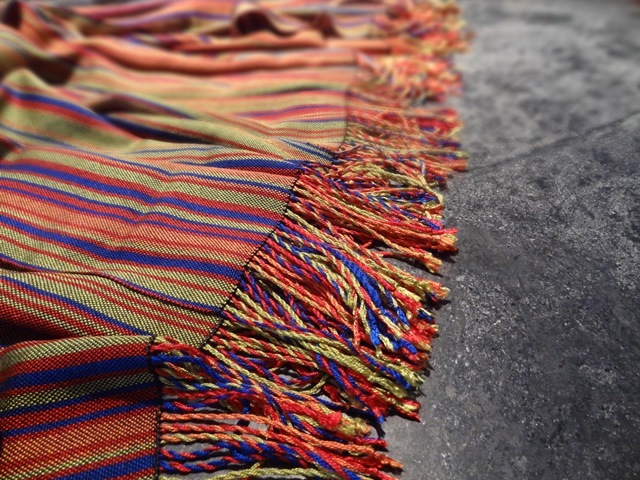 I do love this plied fringe! My conclusion from this sample? 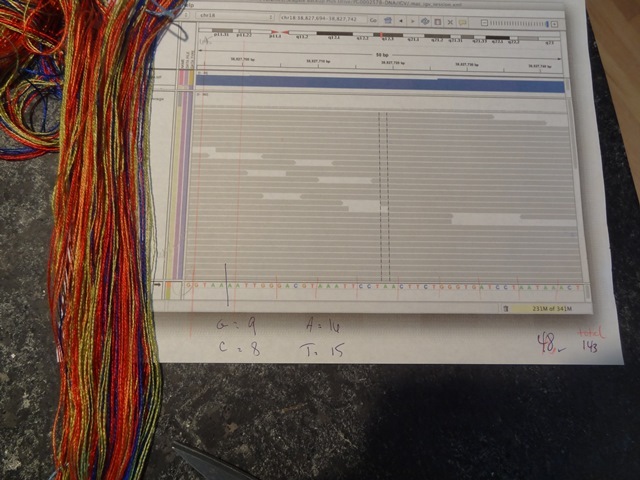 24 epi, but keep the beat gentle so it’s a bit more warp faced. Black weft shows the stripes best. And work faster. When we left our yarn last post, it was getting a nice cherry red overdye on the portion previously painted with small black sections. Here are a pair of skeins after all the dyeing has been done. 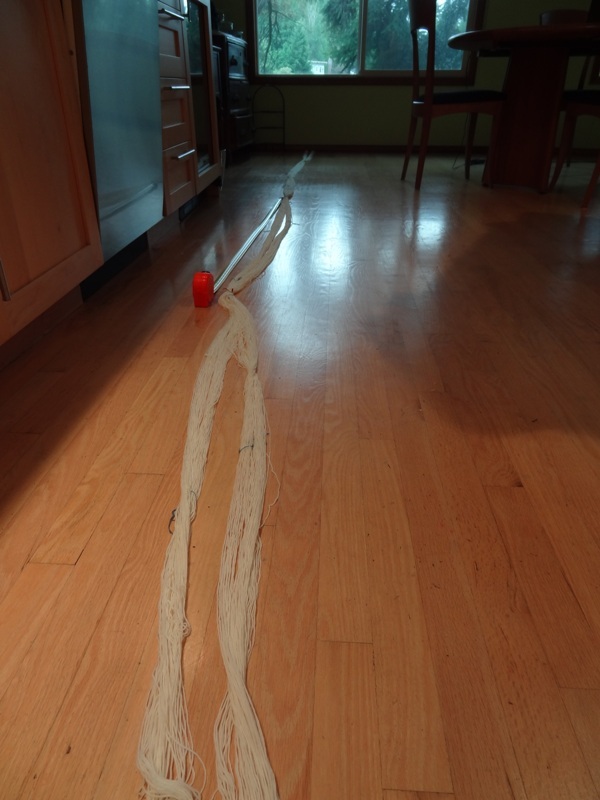 But who wants to deal with a skein of yarn that’s over six yards long? No one, clearly, so it’s off to be reskeined to a more workable skein diameter. 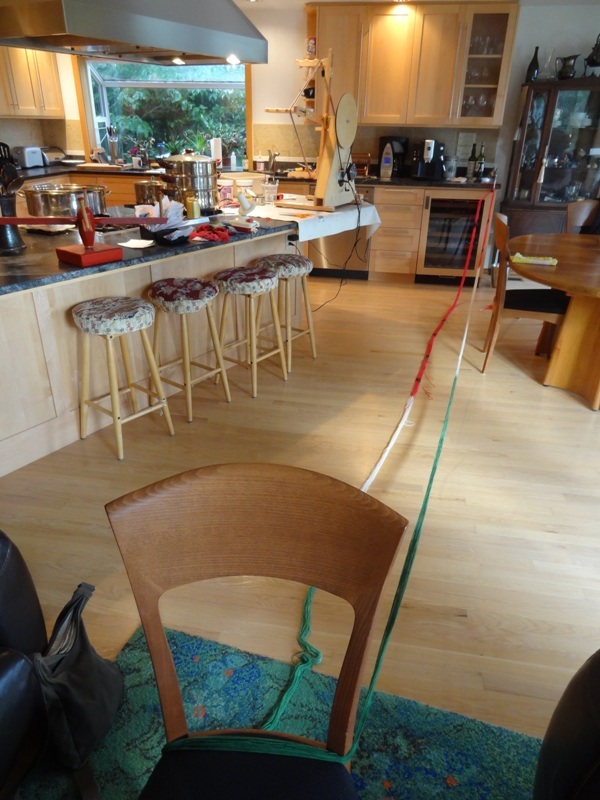 The skein is looped around a chair, then through a C-clamp attached to the counter. The end of the skein is going to the electric skeiner on the left, where’s it’s being wound into a standard 2-yard diameter skein size. When I’m not taking a picture of the process, I’m up near the skeiner pulling the yarn forward and untangling it as necessary. There’s too much friction in the system to be able to sit back and watch the yarn wind off, I have to actively move it along. It’s a good upper body exercise, rather like hauling up an anchor! Finished skeins look like this. 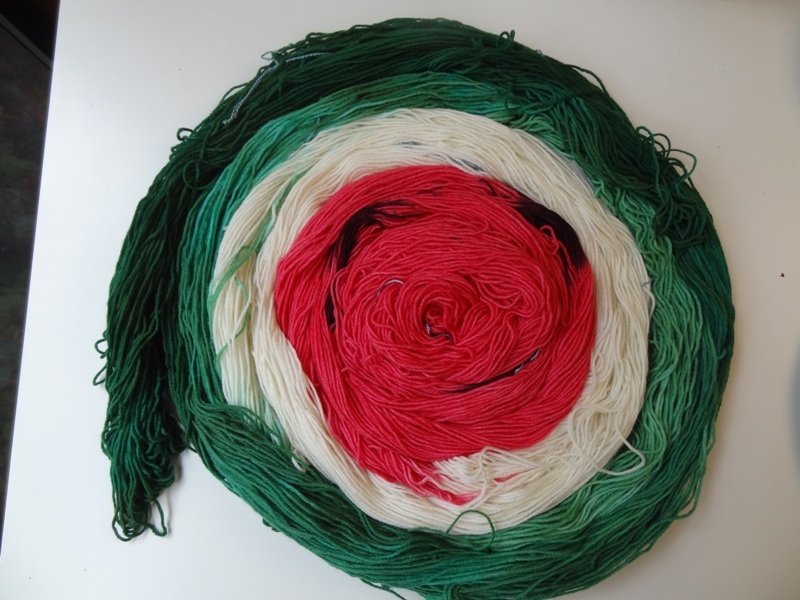 The small green skeinlette is a matching one for knitting heels and toes that are a solid color, rather than getting clumpy striping due to the change in diameter of the knitting in those areas. This has turned into a pretty popular option, with more than half of the customers choosing to get the solid skeinlettes. 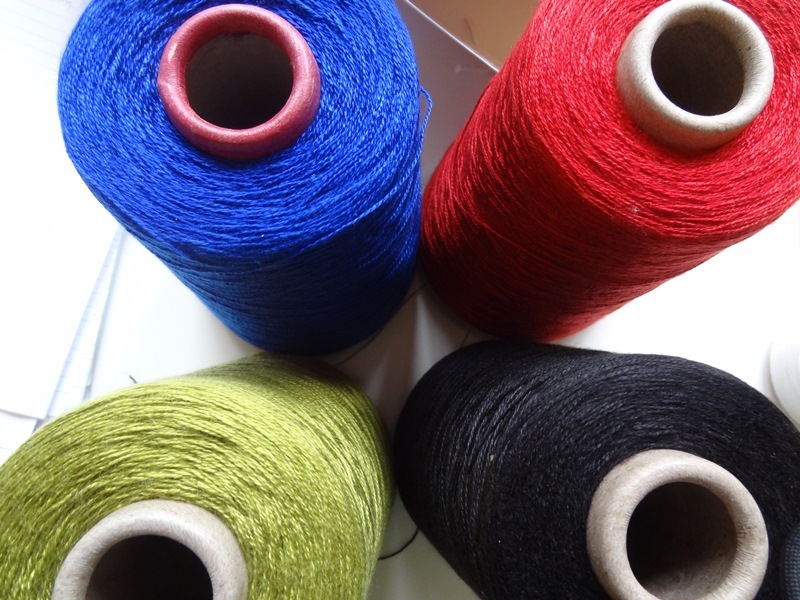 We’ll finish off with a shot of a sample length of the yarn, wound into a small ball. 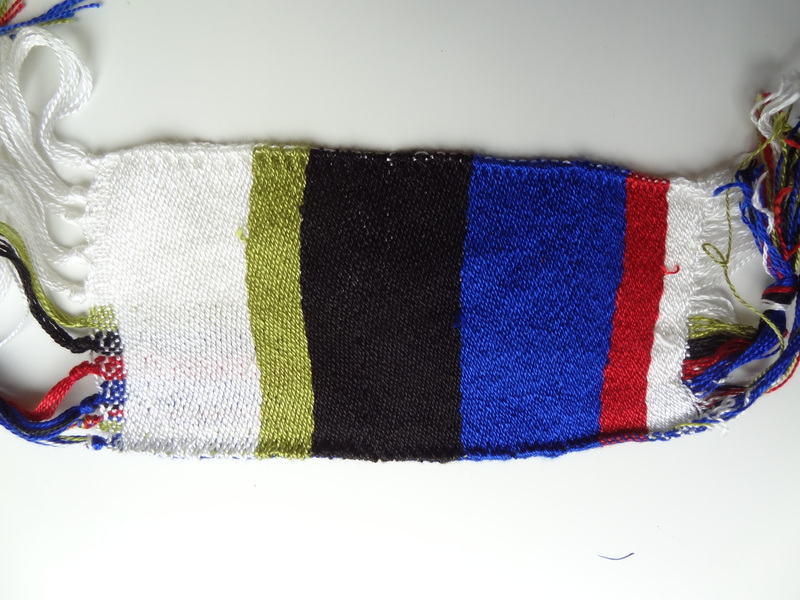 The final step is knitting this onto my Tube of Eternal Sampling so see how the self-striping pattern actually works. And that’ll be the next post! 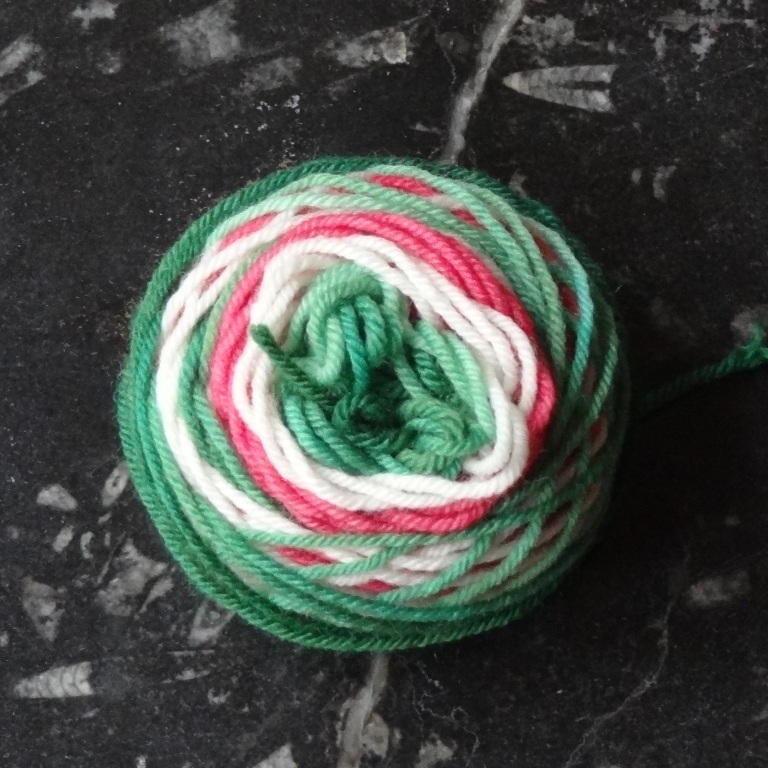 I’ve been dyeing some yarn in a watermelon-inspired colorway, and thought I’d take the opportunity to share someof the dyeing process with you. 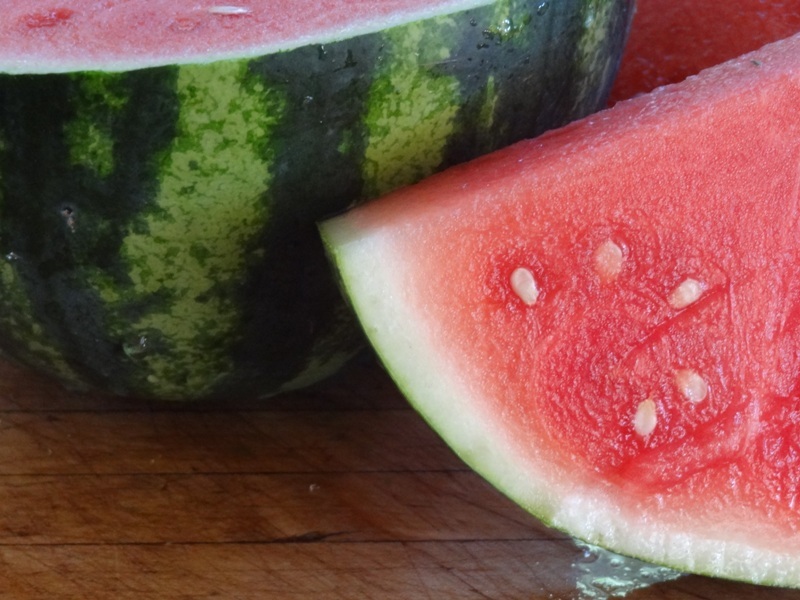 First, let’s look at some watermelon. 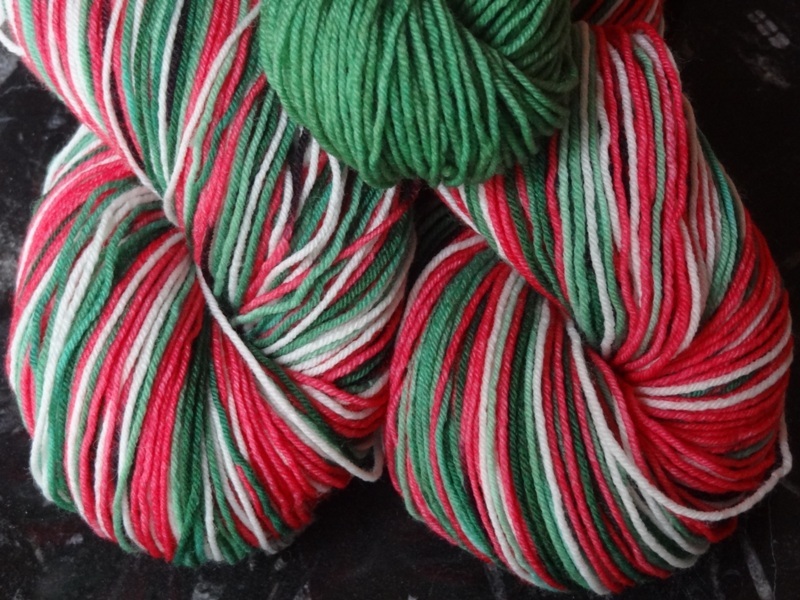 I want a self-striping yarn, so naturally it’s going to be green, white, and pink stripes. But I also want the seeds, and I want them to be black. Here are some test samples. They’ve all been steamed, so the colors are set. The green gradation is nice, so I’ll use that green formula. For the watermelon seeds, there are two techniques in process here. 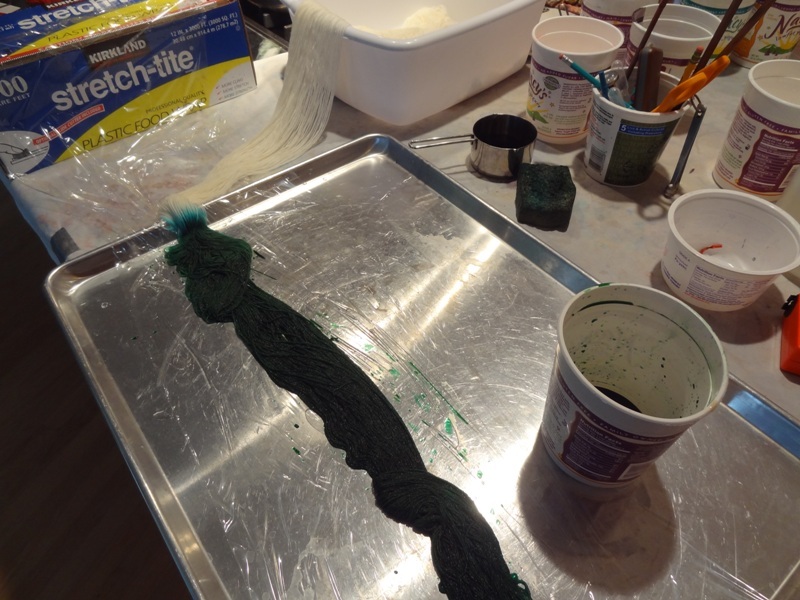 The red and black skeinlette was painted black, then red was added. 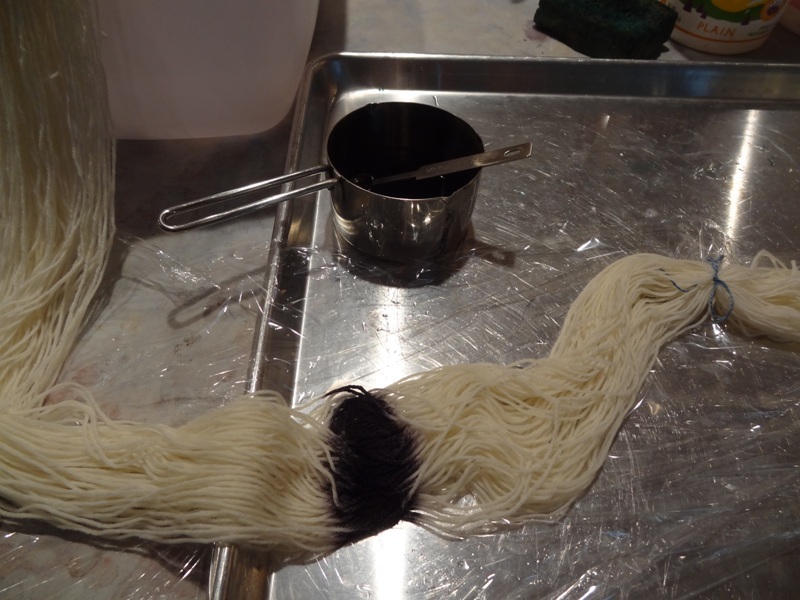 The white and black skeinlette will get an overdye in a red dyebath to see which technique gives me the effect I’m hoping for. Now we’re looking at the same red/black skeinlette from above on the left, and the newly overdyed red/black skein on the right. 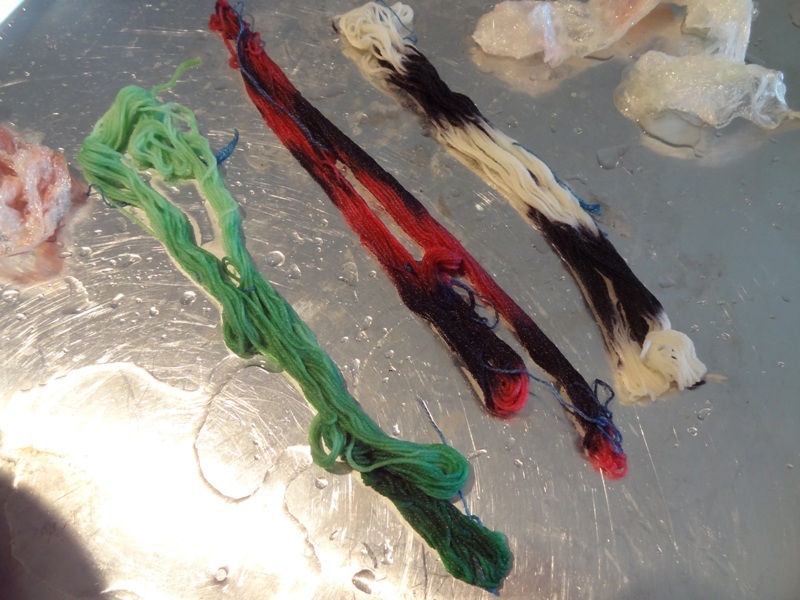 On left skeinlette, some of the black dye mixed with the red, shifting the color. 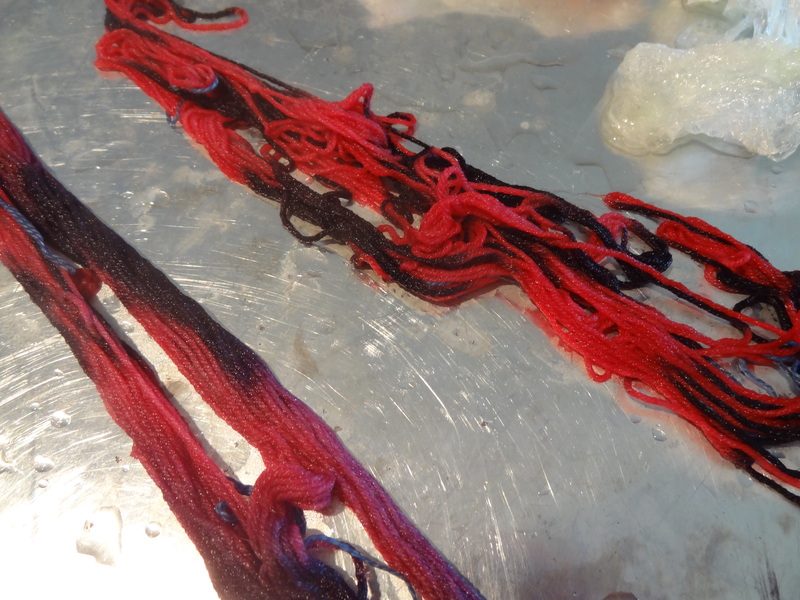 The overdyed skein to the right keeps the red true to itself, so that’s the way to go. 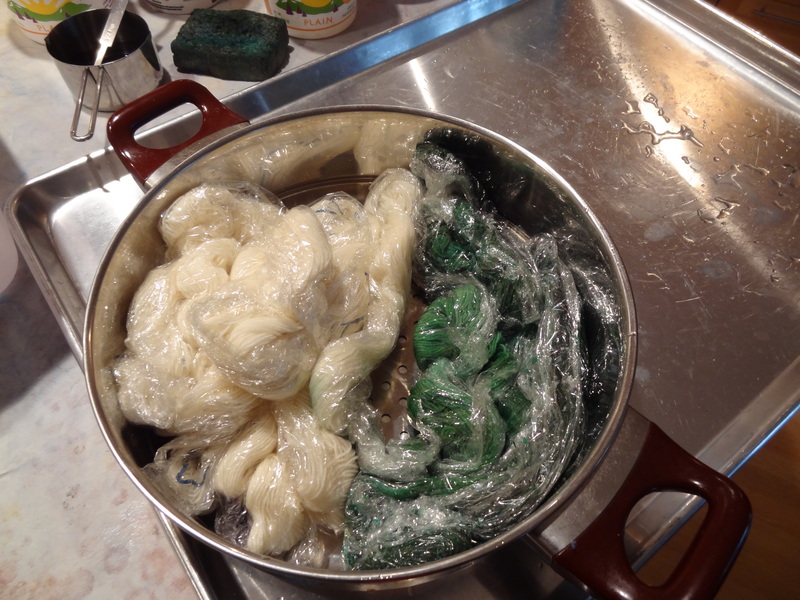 Now to dye a full skein. 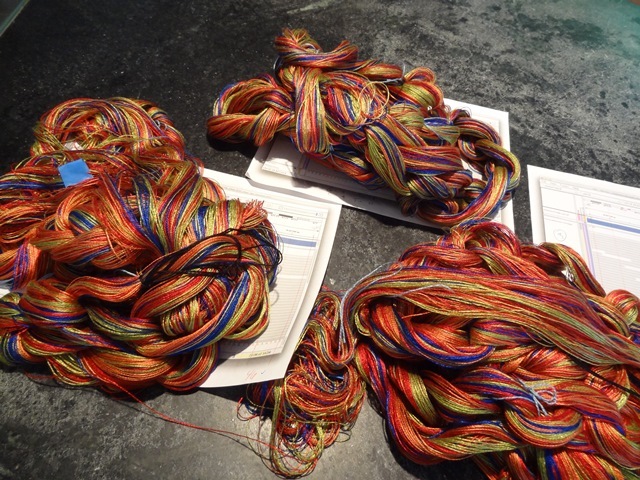 Actually, I dye the self-striping yarns two at a time, so here are two skeins laid out in the floor. I’ve wound them off on a warping board, soaked them in water, and laid them out to mark off the lengths that get dyed each color. I use twist ties to indicate where to do the color changes. This colorway will have three shades of green. Here’s the darkest green, which is the end of the skein. The skein is on plastic wrap, which gets wrapped around the yarn as I go, to keep the colors from rubbing off on other sections of yarn. I’ve painted all the green sections, moved past the section that will stay white in the middle, and now am working on painting the black seeds. The first pair of skeins had way too much black — it spread a lot more than I anticipated — so I’m just painting on very short sections. Now all the painted parts are done, and it’s ready to steam. 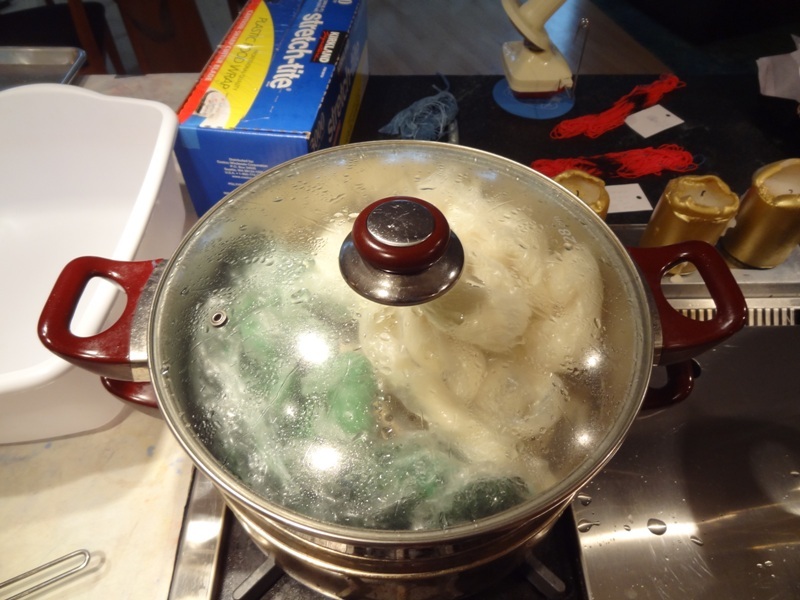 Don’t confuse the yarn steamer with the char sui bao steamer! 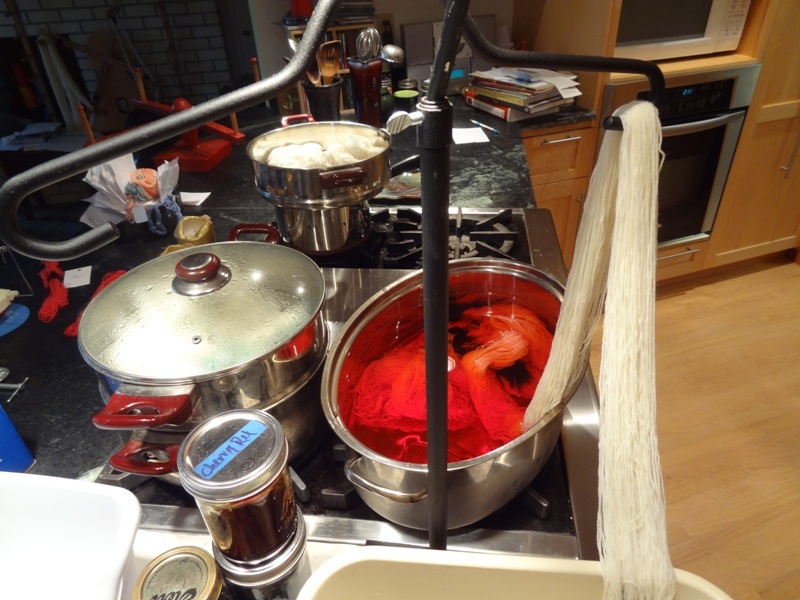 After the painted sections are steam set, the end of the skein that will be red and black gets its red overdye. You can see the black sections — since the black has been already been steam set, it won’t spread out or effect the red dye at all. Stay tuned for the rest of the process!